This installation consisting of a large photograph was made for the Ronald McDonald Kinderfonds Sport Centrum for handicapped children and teenagers in Amsterdam. Handicapped youngsters were photographed in situations in which their bodies can temporarily give up restrictions in relation to gravity. In one image we see the youngsters caught as they jump into the water. In these picture the progression of time is captured in a single encompassing image by stitching different instants of time together. The freedom which is expressed in the freely propelled bodies temporarily cancels the difference which separates the disabled youngsters from their able bodied contemporaries. 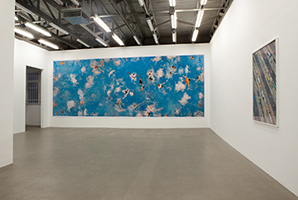 The photo depicted here shows the installation of part of the work in the neutral space of a gallery, with which it is transported from its original context.